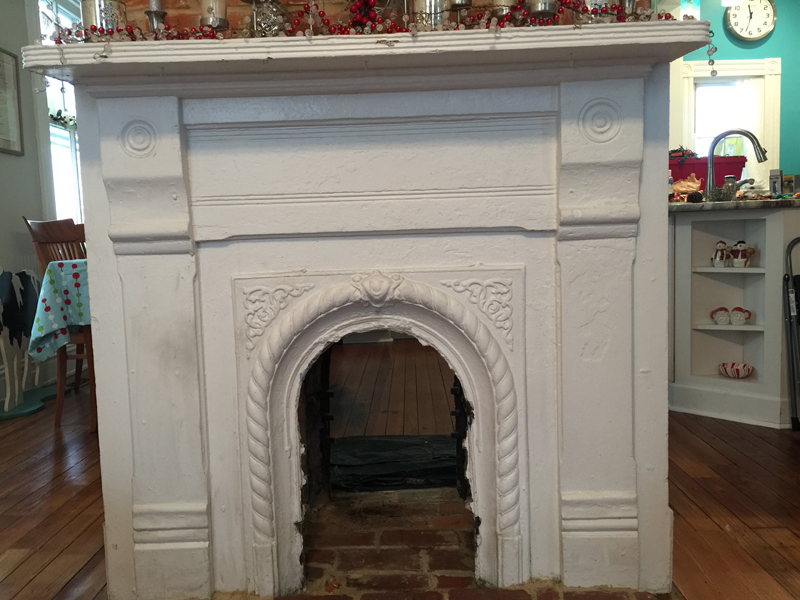 We're often asked about knocking out the rear wall between 2 back-to-back fireplaces to make it see through, or taking out the rear wall of a fireplace that backs up to a deck, porch or sunroom to make it usable from both sides. This never works, and here's why. Fireplaces are built with a formula that allows them to draft properly. 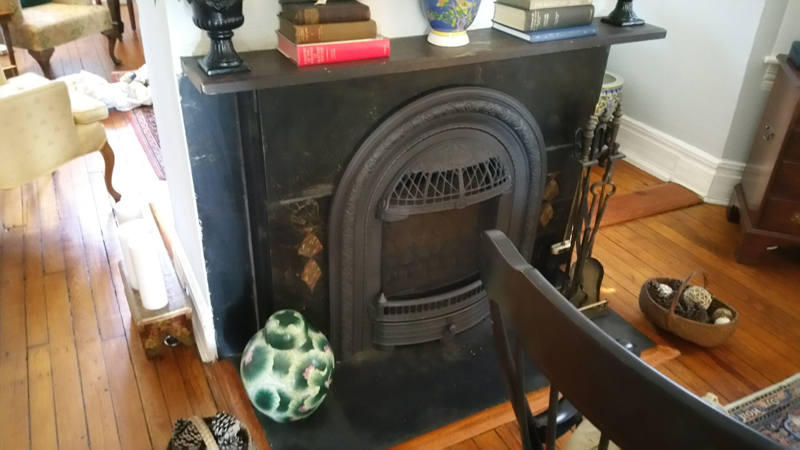 The size of the FIREPLACE OPENING (height x width) has to be commensurate with the AREA OF THE CHIMNEY. If the chimney is square or gently rectangular then the chimney must be at least 1/10th the size of the fireplace opening; if round then the chimney area can be 1/12th the size of the fireplace opening as a round flue drafts with less resistance. The area of the chimney is the width x length of the flue size. If the chimney area is too small for the size of the fireplace opening then the chimney can't carry away the smoke and other byproducts of combustion because the volume of air entering the chimney is too great. So when you double the size of the fireplace opening by removing the rear wall then the chimney is simply not able to exhaust the higher volume of air and the smoke and fumes it carries with it. In the picture at left, 2 fireplaces were back-to-back in separate rooms. The new owner of this turn-of-the-century home wanted an open floor plan so she had the walls around the fireplaces removed to open the kitchen into the living room and aesthetically wanted to have a fire visible from each side so she had a brick mason open them up. While each fireplace originally had its own dedicated flue within this single chimney, there's no way to make the air from each fireplace opening rise up the separate flues. Concurrently, within the same old Richmond neighborhood, we have another family with the exact same issue. The contractor who "flipped" the house also decided on this open floor plan concept accented by a see-through fireplace. 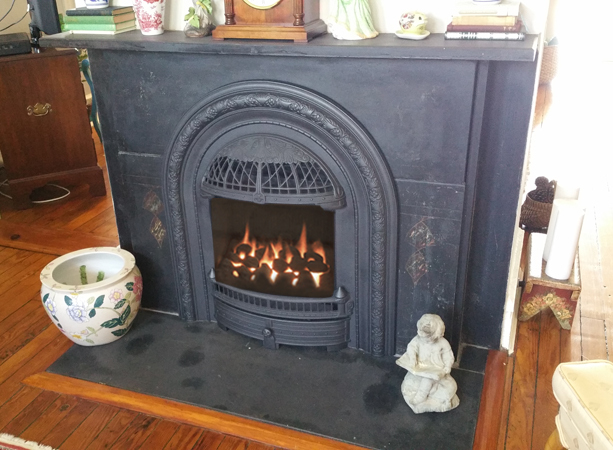 The new homeowners decided to convert to gas since the fireplace smoked when burning wood. Again, this is dangerously bad logic. If a fireplace smokes when it burns wood, then you know it's not carrying away the fumes caused by combustion; gas logs also make fumes, including carbon monoxide, and you may not be aware of how badly it's performing when there's no smoke to warn you of this dangerous situation. So an open burning gas fire is not the solution. The next question is "do you have a see-through gas insert that will fit?". The answer is no, primarily because see-through fireplaces really were not built in Victorian and turn-of-the-century homes. 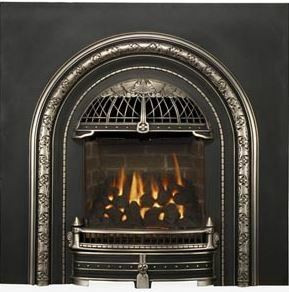 The idea behind little coal fireplaces was to provide heat for a single room, and that ideally you could close off the room to keep the heat from one little fireplace in that room. So, how to cure a see-through fireplace issue? Both electric and gas inserts are available, but again, not in see-through models. Since both the homeowners we've been helping through this scenario wanted to see a fire from each side of the room, they both opted for two gas inserts installed back-to-back. The customer below was ecstatic at how their project turned out. The Windsor gas inserts look original to the house and look fabulous with its slate mantels, and have brought the fireplaces back to life. He called me recently to tell me that when they lost power 3 days after the installation for 6 hours - in 5 degree weather - that their new gas inserts kept the house cozy warm.